We live in a country where 95 percent of eggs on the market come from birds kept in cages so small they can barely move, where mother pigs are treated like piglet-breeding machines and made to live in crates barely larger than their own bodies, where chickens raised for meat are kept in crowded barns where the air is almost un-breathable, and where castrations, tail dockings, toe clippings, brandings and other mutilations are done routinely and without regard to the pain they cause. Kept out of the public eye, these cruelties and others constitute the daily experience of hundreds of millions of farm animals. As more consumers have learned about the horrors of factory farms, they have increasingly demanded that farm animals be given better, more humane treatment. They have also shown that they are willing to pay a premium for meat, milk and eggs from “humane” farms. This growing demand has led to the creation of more than a dozen animal welfare assurance schemes sponsored by industry groups, food retailers and third-party organic and humane certification organizations. Government-regulated animal welfare labels and marketing claims have also emerged and expanded. And yet, we must ask ourselves, what do these labels and assurances really mean? What does it mean to be “humane?” Is it humane to keep an animal in a barren, crowded barn for her entire life so that she rarely, if ever, sets foot outside? Is it humane to take a baby from her mother mere hours after she is born? Is it humane to suffocate newly hatched roosters just because they hold no value for egg producers? Is it humane to transport an animal hundreds of miles by truck so that she can be hung upside down and have her throat cut while still conscious? 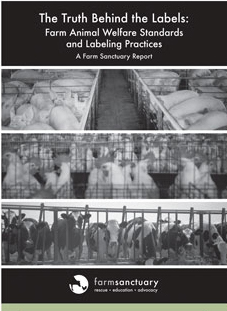 In Farm Sanctuary’s new report, The Truth Behind the Labels: Farm Animal Welfare Standards and Labeling Practices, we keep these and other questions firmly in mind as we critically examine the claims used to market so-called “humane” animal agriculture. The information presented in this report may surprise you. As you read, I hope you will think about how well the practices that are being sold as “humane” coincide with your own values. Read the report summary now, or download the full report, then share it with your friends and family.